D. CLUB HOUSE, CHANGING ROOMS, RANGE AND LICENSED BAR. Article 72 of the Memorandum and Articles of Association of Stratford Oaks Golf Club Limited (SOGC) empowers the Directors to make alter and repeal Rules as they deem necessary or expedient or convenient for the proper conduct and management of the Club. These rules are binding on the members until set aside by the Directors or at a General meeting of the Club. Where Articles are quoted they refer to the current issue of the Articles of Association of SOGC. Any reference to the Rules of Golf are to the current Rules of Golf in force at the time as approved by the Royal and Ancient Golf Club of St Andrews. In the event of any apparent conflict of interpretation between the Articles of Association and the Rules the Articles take precedence. The Rules are intended to enable the members to promote SOGC and to enjoy the playing of golf and the use of the facilities at its premises. i. The Officers of the club shall be the Directors appointed in accordance with Articles 44 to 48 of the Articles of Association. ii. The Mens Captain and the Ladies Captain if not directors shall be entitled to attend meetings of the directors but shall not be entitled to a vote. iii. No remuneration shall be paid to the Directors save as set out in the Articles of Association. • maintain procedures for the investigation of disciplinary issues and to undertake the investigation and conduct of disciplinary processes affecting members of their respective sections. • keep the Directors fully informed of any material decisions and of any changes in their rules or processes. • hold monthly meetings and an Annual general meeting to conduct their business and to maintain minutes of all such meetings and supply copies to the Directors. • nominate a Mens and Ladies Captain for election by the members of the respective section such appointment to be approved and ratified by the Directors. The Directors shall not withhold their approval unless they have substantial grounds as to the character or fitness of the person nominated. • to maintain such other procedures or rules as may be deemed necessary to enable the smooth running of the section. All such rules shall be submitted to the Directors for the purpose of ensuring compliance with club policy and legislatory compliance. i. The Directors shall hold an Annual General Meeting and such other meetings as are deemed appropriate and necessary as set out in the Articles of Association. ii. The Members shall hold such meetings as are specified in the Rules of the Mens and Ladies sections. i. The Directors shall from time to time determine the classes of membership appropriate to the composition and structure of the Club and shall determine the annual fees payable for each respective class of membership. ii. For the avoidance of doubt every member of whatever class shall have the rights privileges and obligations set out in the Articles of Association. Any complaint or allegation against a member relating to breach of the rules or improper conduct will be investigated and dealt with under the disciplinary procedures of the club. The Director of Golf will be responsible for the staff and any complaint relating to any member of staff must be addressed in writing to the Director of Golf. No employee of the club shall be reprimanded by a member and any inappropriate conduct by a member towards the Club’s employees will be referred to be dealt with under the disciplinary processes of the appropriate section. The Directors may from time to time determine the appropriate standard of dress expected of members, visitors and guests both on the course and in the clubhouse. Such dress code will be posted in the club house and on the website and will be reviewed at regular intervals to ensure that it takes account of acceptable fashion trends. No notices shall be exhibited in the club house changing rooms or on the course without the consent of the Director of Golf save that items for sale or rent may be posted on the board in the vestibule to the changing room supplied for that purpose. Members are requested to restrict the use of mobile phones on the course or in the club house to emergencies only and to avoid interference with the enjoyment of others. GPS and other devices may be used only in accordance with the Rules of Golf. Dogs, other than assistant dogs, are not allowed in the club house or on the course. There are no designated car parking spaces in the car park other than those provided for disabled users. Members are requested to park within the designated lines and to avoid obstruction to other users. Members may introduce guests to the facilities of the Club. The Directors shall from time to time determine and publish the appropriate green fee to be paid for a guest playing with a member. Members shall be responsible for their guests and for all liabilities incurred by or on behalf of such guest and shall ensure the guest observes the Club Rules. Members are permitted to introduce up to three playing guests per visit during the week and one playing guest at weekends and Bank Holidays. Members may only introduce the same playing guest six times in any one membership year. 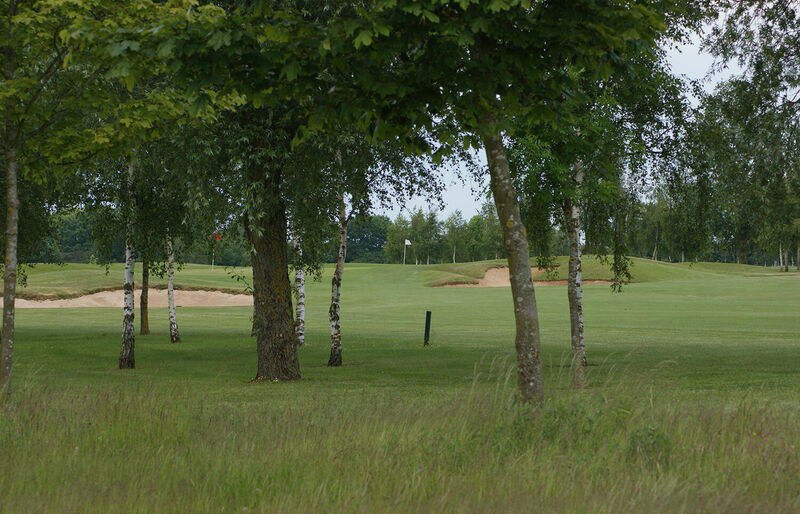 At the discretion of the Director of Golf visitors may play the course having paid the appropriate green fee to be decided and published from time to time by the Directors. Visitors shall be entitled to use the facilities of the course and the club house. D. CLUB HOUSE, CHANGING ROOMS, RANGE, AND LICENSED BAR. i. Smoking including the use of electronic cigarettes is not permitted within the Club premises or in the immediate vicinity of any entrances or exits. When smoking in other areas members and their guests are asked to show consideration for non smokers and to ensure that they deposit any cigarette or cigar ends or other waste in the ashtrays and waste bins provided. ii. The Club House range and changing rooms shall be opened and closed at such times as the Directors shall from time to time decide and publish in notices and on the website. The provision of restaurant and other catering facilities shall be at such hours as the Directors shall determine from time to time. iii. All property belonging to members guests or visitors anywhere on the course or on club premises or left with the club’s staff remains the property of the owner and the club will accept no liability for any loss theft or damage to such property however it arises. All intoxicating liquors and consumables stored on club premises shall be the property of the Club and the purchase and supply thereof shall be under the sole control of the Directors. No intoxicating liquors shall be supplied to members or others on the club premises otherwise than by or on behalf of the club. No intoxicating Liquors will be supplied to any member or other person who is or in the absence of proof is deemed to be under the age of 18 years. The permitted hours for the supply of intoxicating liquors shall be as determined from time to time by the Directors in accordance with statutory requirements. Normal bar hours will be displayed in the club house and published on the Club website. All expenses incurred by members shall be paid immediately and no credit will be given. The rules shall be the The Rules of Golf adopted from time to time by The Royal and Ancient Golf Club at St Andrews subject only to such additions or modifications as the Directors may consider necessary to meet the requirements of the course. The etiquette of golf as adopted by The Royal and Ancient Golf Club shall be adopted and observed by the members. Members will conduct themselves with consideration for other players and with the care of the course in mind and will demonstrate courtesy and sportsmanship at all times. Green keeping staff shall have priority on the course at all times and players shall not play until it is safe to do so. Members may make reservations to play through the online booking system in accordance with conditions determined from time to time by the Directors. All players including members, visitors or guests but with the exception of players in a competition or match with an allocation of tee times, shall report to the reception or at the bar before the start of their round. Local rules may be determined from time to time by the Directors in consultation with the respective sections of the Club and will be published on the website and on notice boards and on scorecards.